A robust mid-product-cycle update for Ford’s big pickup truck. 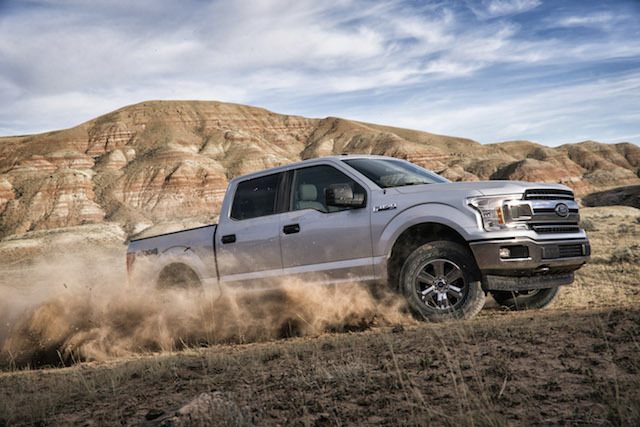 For 40 consecutive years, the Ford F-150 has been the best-selling pickup truck in America. Indeed, it has also been the best-selling passenger vehicle for most of that time too, a streak that goes back 35 years. 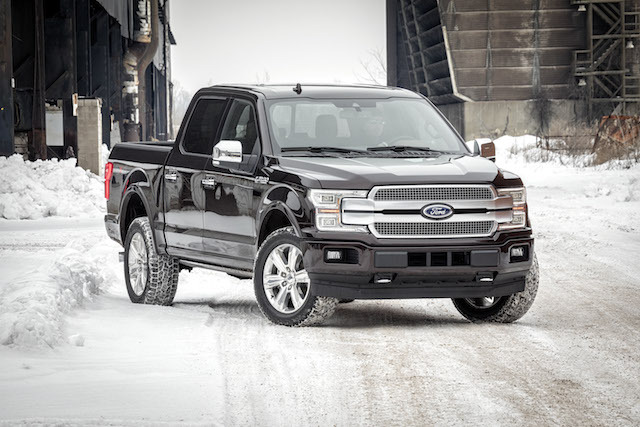 Last overhauled in 2015, the 2018 Ford F-150 reflects the next important update for this full-size pickup truck as Ford introduces new or updated gasoline and diesel engines to the model line. The 2018 F-150 officially debuts this week at the North American International Auto Show in Detroit. Three years after the current model made the transition to a high-strength, aluminum-alloy body, the 2018 edition receives several technological and safety updates, including available pre-collision assist with pedestrian detection. Also, a 3.3-liter naturally aspirated V6 gasoline engine will replace the current standard 3.5-liter and a 3.0-liter, turbo-diesel V6 will join the engine family. As for the new gas engine, the 3.3-liter V6 is projected to offer the same 282 horsepower and 253 lb.-ft. of torque as the previous model’s standard 3.5-liter V6. Further, Ford is rolling out the second generation of its 2.7-liter EcoBoost V6, featuring dual port and direct injection technology. And just as the 3.5-liter EcoBoost V6 is currently mated with a 10-speed automatic transmission, beginning in 2018 the smaller EcoBoost will be likewise paired. Rumors of a turbo-diesel engine for the F-150 have been circulating for years. Early on, some analysts speculated the 3.2-liter, five-cylinder turbo diesel found in the Ford Transit commercial van would get the nod. Instead, Ford has developed an in-house 3.0-liter Power Stroke diesel and will pair it with the 10-speed automatic transmission. Apparently, the engine is similar to the one used in some Jaguar and Peugeot-Citroen vehicles, but the design and development is exclusive to Ford. As for the lone available naturally aspirated 5.0-liter V8 engine, Ford promises increased power and torque. It, too, will be united with a 10-speed automatic transmission. Other changes for the 2018 F-150 underscore this model’s major mid product cycle update. For instance, all trims will sport new grilles with distinctive styles offered from grade to grade. New headlamps and bumpers will also roll out in an effort to provide a firmer stance and wider look to the big truck. F-150 fans will see notable style differences such as on Lariat models equipped with the sport package. Here, you’ll find signature twin bars matching the trucks’ exterior color. Six new wheel designs will roll out, ranging from 17 to 22 inches. 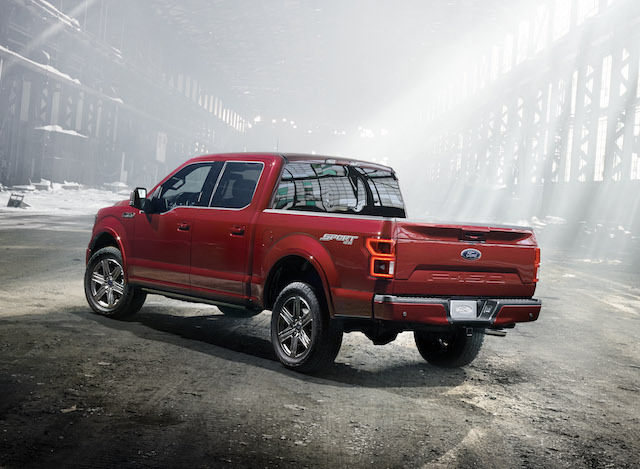 From the rear, a sculpted tailgate with F-150 embossing is evident on lower trim models, while King Ranch, Platinum, and Limited versions dispense with that look for tailgate appliqué. All F-150 models benefit from a new tail lamp design. On the tech front, several available equipment options are planned, including adaptive cruise control with stop-and-go functionality, pre-collision assist with pedestrian detection, an embedded 4G LTE modem for a Wi-Fi hotspot, and a Bang & Olufsen audio system called B&O play. Also available is SYNC and SYNC 3 with FordPass, Android Auto and Apple Car Play compatibility, a 360-degree camera, lane keep assist, and a blind spot information system. Rounding out the changes for 2018 are seven new exterior colors and two new interior colors. 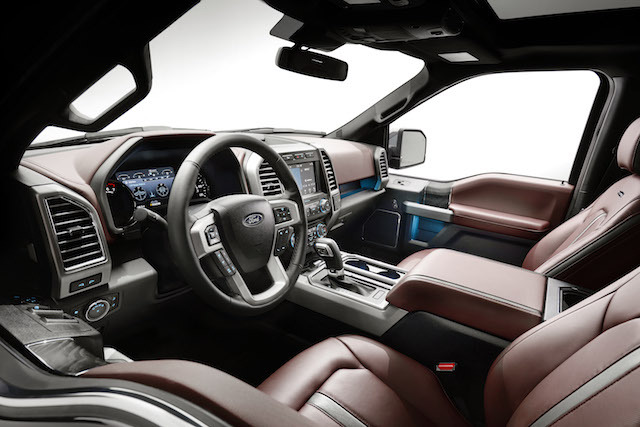 Moreover, carbon fiber appearance appliques will appear in the XLT Sport and Lariat Sport models, while the F-150 King Ranch will gain new Kingsville Appointed seats. Pricing for the entire 2018 F-150 line will be announced at a later date. The refreshed truck will go on sale this fall.